The journey of Aquapioneers began after we (Guillaume on the left hand side and Loic on the right hand side) had both been attracted to the Green Fab Lab of Barcelona after quite different individual journeys, and for apparently very different reasons. Despite these differences, it quickly became clear that we had converged to this special place out of a shared passion for sustainability, social change and technology. 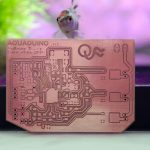 Aquapioneers is an open source hardware and software project, born from a combination of Guillaume’s open source aquaponic project during the FabAcademy 2016 and Loic’s earlier contact with Aquaponics back in Israel. Their complementary interests and knowledge in biotechnology, urban innovation and digital fabrication, backed by a common background in engineering, converged into a multiscale Open Source Aquaponics project. What is the Green FabLab? As part of IAAC’s ( Institute for Advanced Architecture of Catalonia) commitment to advancing ecological habitability in the world and making the use of all available technologies and resources, the Green FabLab was created as a research centre focused on the concept of self-sufficiency. Aiming at leadership in the application of this concept, it offers a unique opportunity to implement innovative technology inspired by it’s natural surroundings. The Green FabLab enables us to push aquaponics to new limits thanks to the tools of digital fabrication and the principles of Open Source designs. Nestled in the heights of Collserola Park, overlooking Barcelona, the Green Fab Lab is a FabLab one-of-a-kind for its focus on self-sufficiency in terms of energy, food and buildings. It is a vital part of the site of Valldaura, a life-sized experimental laboratory dedicated to demonstrate self-sufficiency and sustainable living. The site, which was acquired by IAAC in 2008 works towards the creation of a self-sufficient habitat and research centre. Located in the Collserola Natural Park, in the heart of the metropolitan area of Barcelona, it has laboratories for the production of energy with the **EnergyLab**, food with the **FoodLab** and things with the **GreenFablab**. It develops projects and academic programmes in association with leading research centres (i.e. MIT, Center for Bits and Atoms, Polytechnic University of Catalunya, i2cat and IAAC, etc) and is part of the Fab City network. The distance between producer and consumer has fundamentally broken our food system: we’re missing a basic connection to, and understanding of, our food. The FoodLab project is dedicated to making Valldaura self-sufficient in terms of food through raising livestock and agriculture by mixing traditional and modern techniques. The lab collaborates with the global Slowfood movement, inviting renowned chefs to cook with local produce according to the « zero-kilometer diet ». 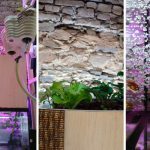 This framework, in the context of the Green Fab Lab, offered a fertile ground for our respective interests in plants, fish and digital fabrication to combine into a unique symbiotic food production project. Aquaponics follows the zero-waste principle of natural ecosystems in which living organisms are interdependent and rely on each other for their vital needs. 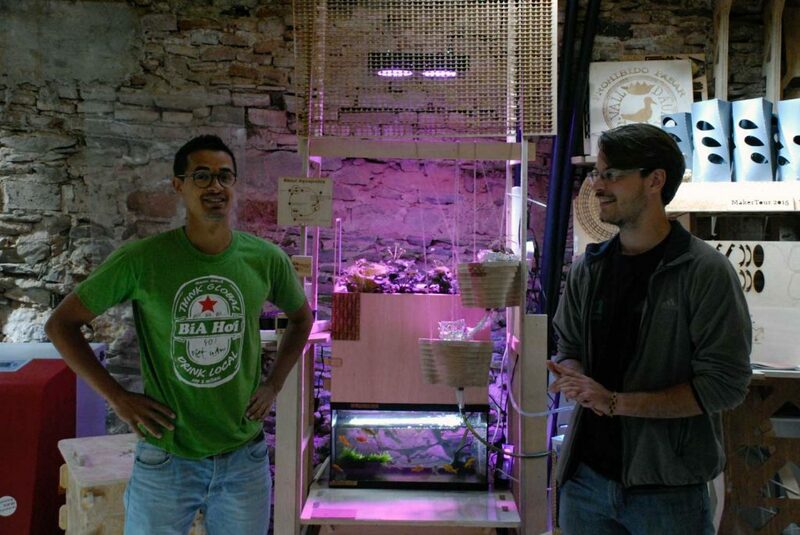 Aquapioneers’ vision is to locally promote aquaponics as a means of sustainable food production in urban areas, using Barcelona as a Living Lab and aligning itself with the Green FabLab’s commitment to sustainability and self-sufficiency. In parallel, it also aims to provide a global open platform of R&D and education, using the power of open source tools combined with the collaborative intelligence of Fab Lab network to inspire and be inspired. What is our status ? Since Aquapioneers’ beginning in February 2016, the project has gained momentum and meanwhile we are successfully operating 2 small systems which gave a first harvest mid-May. Moving on to the next scale, we are presently working on an aquaponic greenhouse which will be operational by the end of June. In parallel, we are collaborating with IAAC on the construction of a FabLab made aquaponic greenhouse on IAAC’s rooftop in central Barcelona. Our first aquaponics lettuces !!! We are looking forward to share our latest developments and designs as they take shape, and hopefully we can inspire some of you to become AQUAPIONEERS 🙂 Our blog will be updated weekly, so stay tuned!